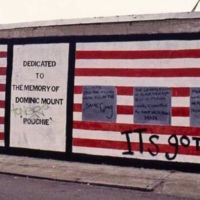 In 1988 David Fichter, with the help of volunteers, painted the Freedom Quilt Mural on the side of the American Friends Service Committee Building in Atlanta, Georgia. 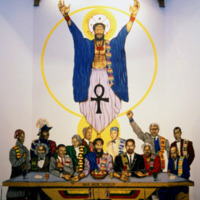 The mural was created as part of the Rainbow Coalition events during the 1988 Democratic National Convention. In February 2015 the building, owned by Georgia State University, was torn down – taking the mural with it. 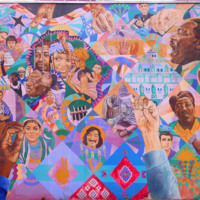 The quilted mural is thematically focused on non-violent heroes of history that struggled for justice and peace. It includes the faces of Mubarak Awad, Nelson Mandela, Winnie Mandela, Desmond Tutu, Oscar Romero, Rogoberta Menchu, Leonard Peltier, Andrew Goodman, Fannie Lou Hamer, Daniel Berrigan, Martin Luther King Jr., Rosa Parks, Mahatma Gandhi, and Lucretia Mott. It also includes the antislavery figures of Frederick Douglass and Harriet Tubman. Tubman points towards the North Star. 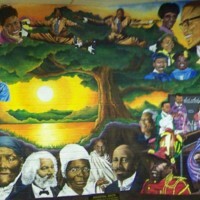 Multi-racial hands stitch the quilt together, joining heroes (both famous and unknown) from all strands of history. 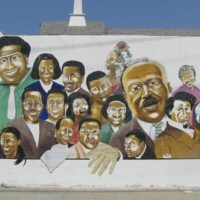 In 2005, an anonymous artist painted a mural in Los Angeles that depicted many heroes of African American history. The faces of antislavery leaders Sojourner Truth and Frederick Douglass, alongside Muhammad Ali, Martin Luther King Jr., Malcolm X and Rosa Parks, lined the street. By 2015, the building had fallen into disrepair and the mural had been destroyed. 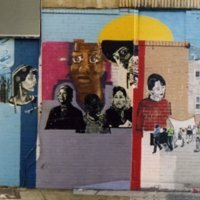 In 2001, Brooklyn-based muralist Leola Bermanzohn created a mural in the Flatbush area of Brooklyn titled Women Warriors. Bermanzohn works as a muralist for the Groundswell organisation, launched in 1996 with the mission of bringing together artists, youth and community organisations to create murals that beautify local neighbourhoods and give expression to underrepresented ideas and perspectives. Women Warriors was created in collaboration with Sister Outsider – an organisation run by and for women of colour that aimed to help women enter the professional world of work and operate in the political realm. 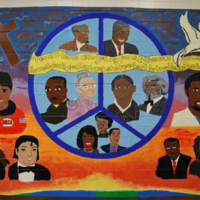 The mural was at the organisation’s headquarters and depicted antislavery leaders Harriet Tubman and Sojourner Truth as well as Nefertiti, Rosa Parks and Assata Shakur, alongside a poem written by Audre Lorde. It had been destroyed by 2015. 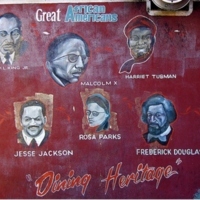 An unknown artist painted this mural in Harlem, New York City, on the facade of Dining Heritage. It depicts the abolitionists Frederick Douglass and Harriet Tubman, as well as Martin Luther King Jr., Rosa Parks, Jesse Jackson and Malcolm X. It was destroyed in 2015.